Courtesy of Vivacity-Peterborough Museum and Art Gallery. A few houses along Ermine street grew into a town covering a large area with a wall around it. Much of the industry, with its smoke and smell was outside the town. The main road, Ermine street ran right through the town and there were gateways in the walls. We know from air photographs that there were all sorts of different stone and wooden buildings in the town. There were shops , workshops , big mansions and smaller houses for poorer people. We think there was ‘mansio’ or inn where people could stay, a forum or market place and some temples as well. There haven’t been any big archaeological ‘digs’ in the town in recent times, so there is a lot there to be discovered. Where there was a Roman town today all it is, is just plain green grass. Over the years it has changed a lot. The town has gone because all of the soil and grass has grown over it. But you can still see the traces of Ermine street, running through the town and the humps and bumps on the ground that show where the town walls were. Today our world is much different to the Roman times. We have our own baths they have to share theirs. We have pounds they had Denarii. So all of this shows that the life is a lot more different. We also have much better technology, such as computers, mobile phones ,motor cars , aeroplanes and electricity! Many children died when they were young and common diseases meant it was unusual that you lived to be very old. The mums were expected to run the house and cook all the meals. The women had a hard life. The father had all the power. He was in charge of the family and would tell the Mother, children and servants what to do. There was no toilet paper. Every Roman used a sponge on a stick to wipe their bottom – yuck! The rich had slaves to do the work for them. The Romans had pet dogs and cats! All the British paid the Romans taxes and tax collecting was very important. The money was used by the Romans to pay for the army. The husband would divorce his wife if she did not give birth to a son. 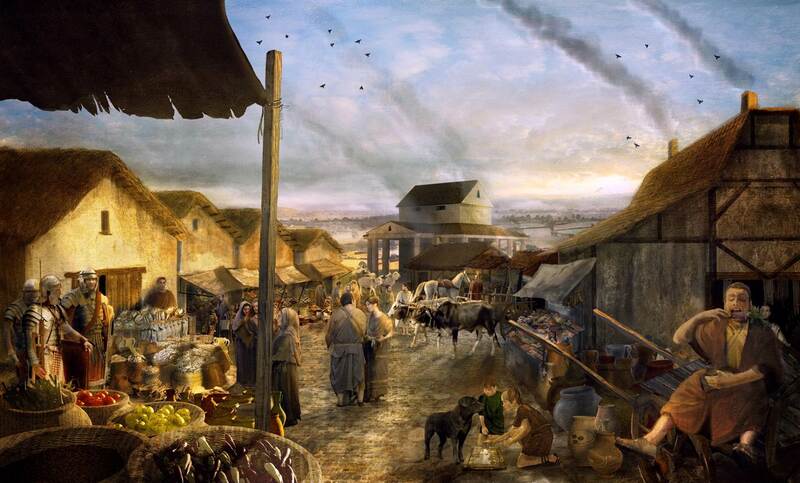 Poor Romans ate porridge, vegetable soup and bread, but rich Romans could afford a much better food, like meat fish and lots of fruit and vegetable. They didn’t have cookers like us but cooked over metal grills with hot charcoal underneath, like barbeques. They also ate peacock venison and oysters. Some rich Romans had heating underneath the floors of their rooms . Wooden tablets coated with wax and tree bark were for writing on. Roman Baths were not private. The bathhouses in towns were not just meant for keeping clean, but places where you could meet your friends and chat!. Women would wash in the morning and men would wash in the afternoon. Hobby: Going to the public bath house to meet my friends. Friends: 3 nice ones 2 weird ones. Family: 4 brothers 1 sister. Hello there. I’m Torano and I am totally rich! I live in Durobrivae in a nice house. My life is awesome and I have a great job – I’m a merchant ,basically just buying loads of pottery and other goods and selling it for a massive profit. Anyway, it’s a real pain having to walk for miles along straight roads to get from one place to another so I use my horse for long journeys. I wish there was a cool invention that could make the journey about as quick as a Torano tornado! Going to the bathhouse is my thing to do at night because everybody else goes there in the morning and afternoon so it’s amazingly quiet and peaceful – just like me. Dormice are definitely 100% my favourite meal (though roasted songbirds are actually quite nice)! My bro Georgemous Maximus is my best member of the family but he is a bit annoying especially when he hits me several times when we’re going on a trip exploring the town. When I was little, I wanted to be a fierce soldier, fighting until I die but I never got around to it. I am Georgemous Maximus and I was related to the family of Julius Caesar until he got assassinated. But I am not upset because he was a cruel man and being related to his family means I have got my important job in Britain. So I will tell you a little about me. So I have a son called Grumio and a brother called Torano. When me and Torano were younger he ran away and eventually came back after a year. I now have a great life with a lot of money and I live in a giant villa near Durobrivae I call it the Praetoruim where I live with Torano and Grumio alongside a load of slaves which cook my delicious dormice which Grumio goes to get every night. A View of the Baths and Site of the Roman Buildings at Castor, west of the church.